The Nishan Sahib is a Sikh holy triangular flag made of cotton or silk cloth, with a tassel at its end. The word, Nishan means symbol, and the flag is hoisted on a tall flagpole, outside most Gurudwaras. The flagpole itself covered with fabric, ends with a two-edged dagger (khanda) on top. Traditional symbol of the Khalsa Panth, the Nishan Sahib can be seen from far away, signifying the presence of Khalsa in the neighbourhood. It is taken down every Baisakhi, and replaced with a fresh flag, and the flagpole refurbished. The background colour of the Nishan Sahib during the early phase of Sikh history was red. Its colour underwent a change, from white to saffron, in the hands of Guru Hargobind and it was hoisted for the first time at Akal Takhat Sahib in the year 1609 CE. However, it is steel blue in colour at Gurudwaras managed by Nihangs. Like a Flag of any institution, this Flag symbolizes the presence of the Khalsa and hence is hoisted at every Gurdwara premises. Therefore, anybody in need of help. However, with the Khalsa now being non-functional, the Gurdwaras serve the purpose of congregational meeting, Langar and lodging. refers to the collective body of saint-soldiers (Singhs/Kaurs). The Khalsa was inaugurated on March 30, 1699, by Guru Gobind Singh, the tenth Sikh Guru. It was then the temporal leadership was passed on from and by Guru Gobind Singh to the Khalsa and thence it became Guru Khalsa. Though, during the next 9 years of his life, Guru Gobind Singh remained the Commander-in-chief of the Khalsa. 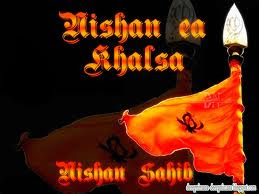 The Khalsa is also the name of nation of sikhs. The Khalsa has responsibilities of leader, hence parliament, and defence. sometimes called a war quoit, is a throwing weapon from India. Its shape is of a flat metal hoop with a sharp outer edge from 12–30 centimetres (4.7–12 in) in diameter. It is also known as chalikar. ( Punjabi: ਕਿਰਪਾਨ kirpān) is a ceremonial sword or dagger carried by orthodox Sikhs. It is a religious commandment given by Guru Gobind Singh (the tenth Guru of Sikhism) at the Baisakhi Amrit Sanchar (a holy religious ceremony that formally baptizes a Sikh) in CE 1699, all baptised Sikhs (Khalsa) must wear a kirpan at all times.. The word Kirpan (Gurmukhi: ਕਿਰਪਾਨ ) has two roots - the first root is: Kirpa (ਕਿਰਪਾ ) which means "Mercy, grace, compassion, kindness" and the second root is Aan (ਆਨ ) which in turn means "Honor, grace, dignity". So together the word stands for "the dignity and honor of compassion, kindness and mercy"